Russia is sending an anti-submarine ship and a missile cruiser to the Mediterranean as Western powers prepare for possible strikes against Syria. The news comes as Britain deployed six RAF Typhoon jets to its Akrotiri base in Cyprus in a move to protect British interests as tensions grow over Syria. Russia, who has stood staunchly behind the Syrian regime during its two-year civil war, has warned Western powers over strikes against Bashar al-Assad’s forces for the use of chemical weapons. 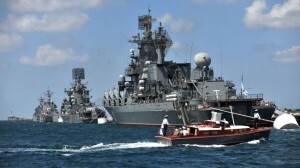 Russia’s Interfax news agency quoted a source in the armed forces’ general staff as saying the warships would arrive in the coming days because of the “well-known situation” – a clear reference to the conflict in Syria. 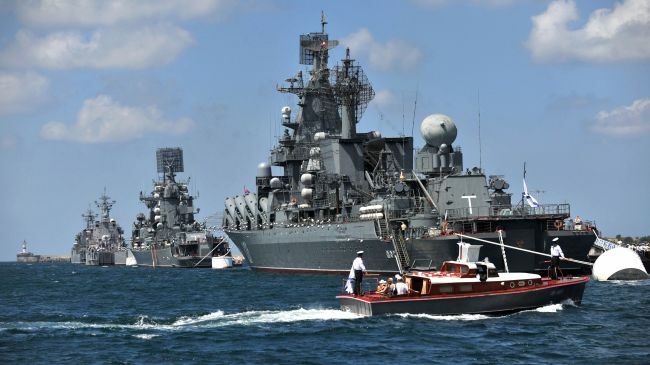 Russia sends warships to the Mediterranean, but says it is nothing out of the ordinary. Britain sends six Typhoon jets to base in Cyprus. France says strike plans against Assad regime “difficult to develop”. The navy later denied the deployment was linked to events in Syria and said it was part of a long-planned rotation of its ships in the Mediterranean. It did not say what kind of vessels, or how many, were on their way to the region. However, the initial Interfax report had made clear that the aim was to beef up the navy’s presence and not to replace the ships in the Mediterranean. Britain also played down the presence of its fighter jets in the region. “This is purely a prudent and precautionary measure to ensure the protection of UK interests and the defence of our sovereign base areas at a time of heightened tension in the wider region,” the ministry of defence said. It also added the jets would not take part in any direct military action against Syria. The strategic movement of military assets comes as Western powers mull a response to the alleged use of chemical weapons by Assad forces. Britain has been pushing for permanent members of the UN Security Council to adopt a resolution which would have authorised measures to protect civilians in Syria. But Russia has refused to agree to the resolution and a diplomatic stalemate continues. Prime Minister Kevin Rudd earlier joined the US and Britain in condemning the use of chemical weapon in Syria, labelling it “an offence against humanity and arguably is a crime against humanity“. Western plans for a strike against the Assad regime are “difficult to develop”, a French government spokeswoman said on Thursday. “The international community must find a riposte that is adapted to the situation,” Najat Vallaud-Belkacem said on France 2 television. Her comments came after US president Barack Obama, who had warned that the Assad regime would be crossing a “red line” if it used chemical weapons, said he had not yet made a decision on retaliatory strikes. Syria denies using chemical weapons and has blamed the opposition for the August 21 attack on a Damascus suburb that killed hundreds of civilians. The UN team trying to determine whether chemical weapons had been used in the area will continue their investigations until Friday and plan to leave Syria by Saturday morning. “I have also expressed [my] sincere wish that this investigation team should be allowed to continue their work as mandated by the member states,” Mr Ban told reporters on Thursday. “I told him that we will … share information and our analysis of samples and evidence with members of the Security Council and United Nations members in general,” he said. UN chemical weapons experts on Thursday began their third day of investigations into the apparent poison gas attack.